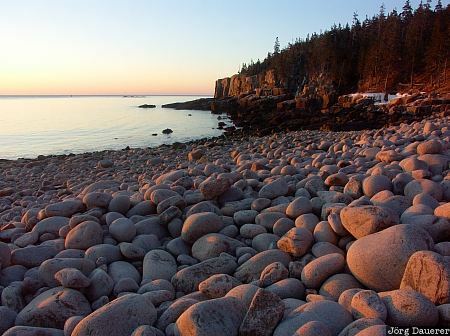 Sunrise at Monument Cove with lots of round rocks in the foreground in Acadia National Park on Mount Desert Island. Acadia National Park is in the northern part of Maine in New England in the north east of the United States. This photo was taken in the early morning of a sunny day in March of 2006. This photo was the image of the month in October of 2009. This photo was taken with a digital camera.